Alpine is a responsive multipurpose one page Joomla theme with parallax effects and based on Bootstrap framework. This theme is ultra responsive and easy to customize with a portfolio filters and the project expander is the best solutions for the creatives, web agency and more. Ultra Responsive Alpine is 100% responsive, each and every element including the awesome slider are fully responsive. Custom Backgrounds Alpine allows you to set a custom background for each section. A super-quick way to get creative with your site. Parallax sections makes your page more beautiful. 3 Home Section versions Alpine includes 3 header versions. You can customize each of them very easy. You can choose between maximage fullscreen slider, pattern flexslider or youtube video background. Isotope Portfolio We create a fullwidth 4 columns portfolio, that never breaks rows. Always display properly. We guarantee this! Font Awesome Integration Alpine includes the popular Font Awesome – The complete set of 369 icons in Font Awesome 4.0.3. Documentation We include the detailed documentation on how to use the theme and it’s features. 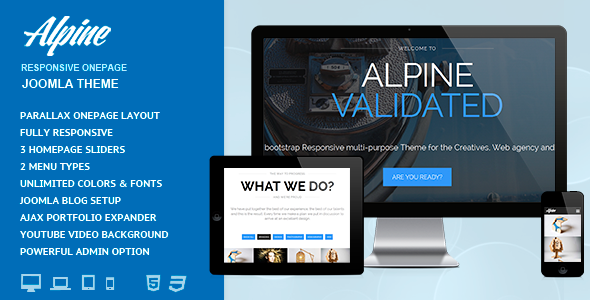 Item Reviewed: Alpine - Responsive One Page Joomla Template 9 out of 10 based on 10 ratings. 9 user reviews.